I use it with an old modded Xbox with Coinops with an LCD TV. 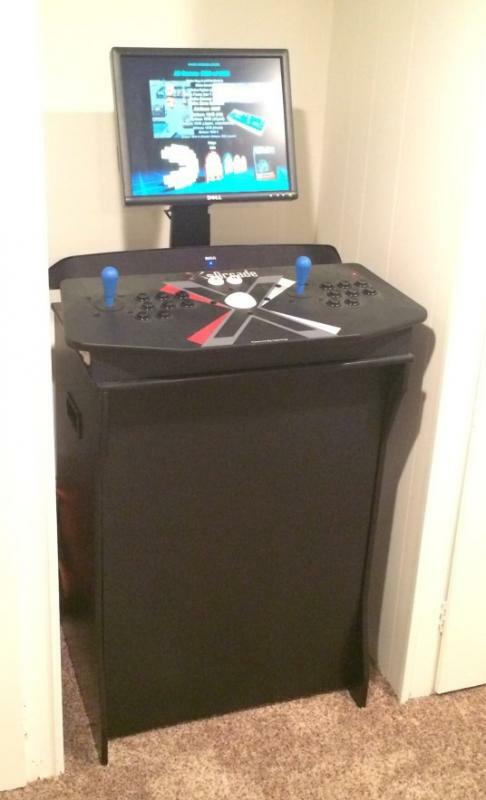 I have very little handyman/construction skills to build a cabinet, so I was looking for any ideas that folks might have to setup an arcade-like setup using things you can buy at the store or online. For example, I have seen some pretty neat setups where they wall mount a small LCD TV (with LED lights behind it) and put X Arcade dual joystick on some type of small bar-height piece of furniture. Anyone have any suggestions or pics of their setup? Edited by NoleOne, Sun Jan 20, 2019 12:07 PM. I realize this isn't really what you're asking for because I had to build the pedestal, but this is my X-Arcade setup. What I did to mount the controller on the pedestal was drill holes in the top surface of the pedestal for the rubber feet that are on the bottom of the controller. The holes are lined up just right so you can plunk the controller down on top of the cabinet and the controller's feet just fall into the holes. No other reinforcement is needed; the weight of the controller keeps it planted and the holes constrain it so it doesn't slide around. The reason I went this route was because I didn't want to do any permanent modification to the X-Arcade to mount it. Another nice thing about it is if I want to take the controller somewhere, I can simply walk up to the pedestal, unplug the cables, and take the controller. How about a standing desk. I put a raspberry pi inside my tank stick. It's self contained with the power supply built in. Just plug it in and has an hdmi out.